You are here: Home / Sustainable Storytelling / The Browncoats are Coming! Firefly Returns? But, last Friday a former producer of Castle and writer of two firefly episodes tweeted that he would sign on too. Then a producer of Battlestar Galactica and co-creator of Warehouse 13 said she would be in! Are you nerdy sci-fi fans frothing at the mouth yet!? 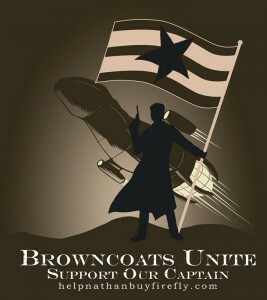 Browncoats, ravenous for glory and unrelenting in fervor, wasted no time in creating a new website and facebook page both titled, “Help Nathan Buy Firefly.” As of this morning (when I pledged my undying support) the movement had gathered pledges tallying $452,000. That isn’t enough to buy the rights to the show (which Fox will most likely never sell). And certainly not enough to produce more episodes, but it is a lot of money in a short time. More interesting would be the implications for entertainment if this wild scheme were to work. What would it mean if an actor and a few industry insiders could team with consumers to produce internet television to their own tastes? Television that won’t produce “American Idol” ratings, but has a pre-established faithful. It has happened with music and now books. Cable networks started the trend for T.V., but this… It’s a libertarian dream. Who knows, if the Browncoats would have fought like this in the year 2511 maybe we would have never lost to the stinking Alliance in the first place! Ahhhh! Why won’t Fox sell the rights when they’re not gonna do anything with them?!! !